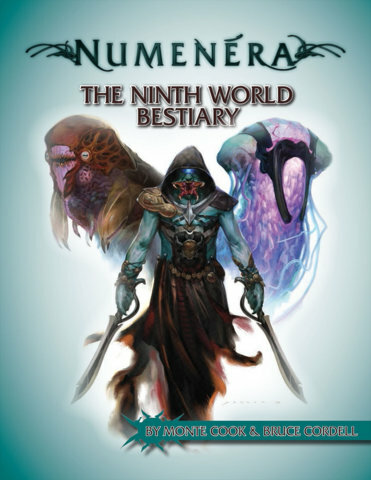 Set in a far, far distant future, the Numenera RPG puts a new spin on traditional fantasy, creating something unique to reinvigorate the imagination of gamers everywhere. Player characters explore a world of mystery and danger to find leftover artifacts of the past: bits of nanotechnology, the datasphere threaded among still-orbiting satellites, bio-engineered creatures, and myriad strange and wondrous devices that defy understanding. Numenera is about discovering the wonders of the worlds that came before, not for their own sake, but as the means to improve the present and build a future. With streamlined, intuitive rules, Numenera allows players to create characters in minutes, emphasizes imagination and narrative, and features an elegant, flexible, and powerful rules set. Numenera is the latest creation of one of the biggest names in roleplaying games, award-winning designer and fan-favorite Monte Cook.